Take the soul scrubbing ride through Sandy Mush Valley to this inviting home. 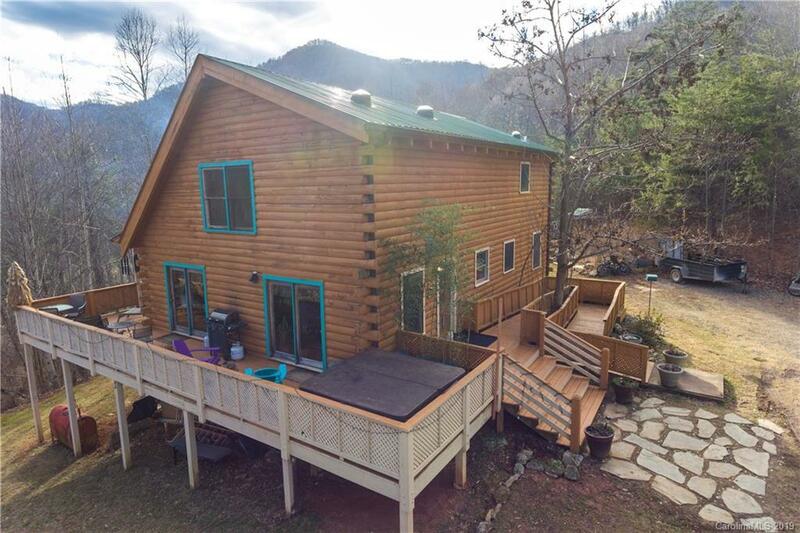 Strong spring, bold creek and well offer year-round water.The log home is centered on 9 acres and looks across to SAHC protected mountains. Summer trees bathe the wide decks with peaceful privacy. Home has lots of improvements by loving hands. The main level Great Room features a floor-to-ceiling stone fireplace, vaulted ceilings and 2 sets of french doors to the deck.The generous upstairs loft doubles as bonus room or office, adjacent Master bedroom has balcony, walk-in closet and private master bath.A full-sized basement with tall ceilings, laundry area and plenty of work and play space is accessed from both from inside stairs and outside at ground level .Bonus graded area below the home for permitted pool and guest house. Extra home site and drive above the house. No Drive-Bys. Agent must accompany.